It was another cold winter morning. I decided to head out early to catch the train to the Palace of Versailles, one of the largest and most opulent castles in the world. If you love history and architecture, you wouldn’t want to miss this. Getting to the majestic palace is pretty straight forward. The Versailles Palace is located southwest of Paris suburb. Purchase a ticket at the station counter that heads to Versailles Rive Gauche. Do note that T+ ticket is not valid for this journey. My French is really that bad and I tend to pronounce Versailles as “ver-sales” instead of “ver-sahy”. Lost in translation. Follow the overhead and signage to get to the correct RER platform. The signs should read RER C Versailles-Rive Gauche or “VICK”. The double-decker train arrive at a regular interval. The “golden mummy” seem to be scattered all around Paris. This great equestrian statue of Louis XIV stands outside all the gates of Versailles, looking out on the town he created. 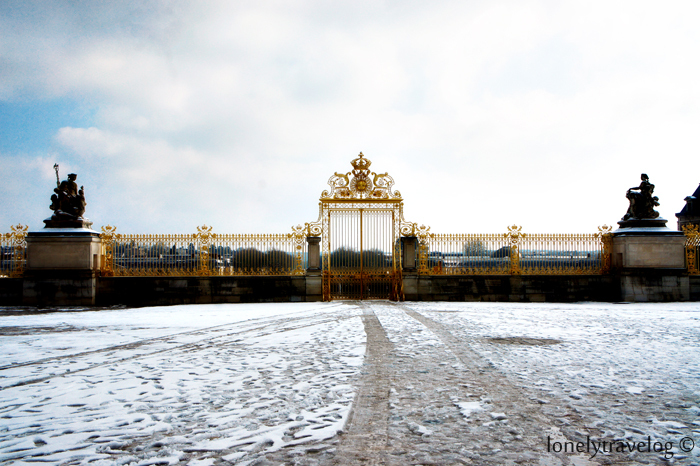 Versailles was made for the King. Humongous palace and gold decorations on the buildings was a sight to behold. 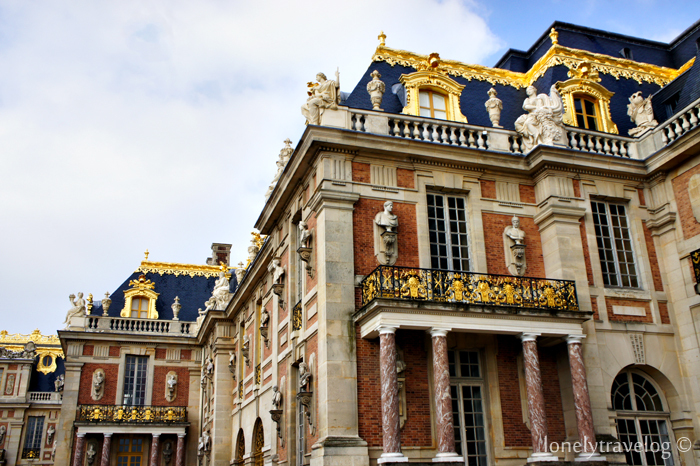 Versailles was the vision of Louis XIV, king of France in the 17th century. He was known as the Sun King who spends the wealth of France to create Versailles on a tremendous scale of construction. This is the inner Royal Courtyard of Versailles. Here you begin to appreciate the amount of gold on the buildings. The downside of visiting a Paris attraction is the queue madness! Like what Audrey Hepburn would say, Paris is always a good idea; book your ticket via online is really a good idea before your visit to any attraction in Paris. Do remember to get your billet first before queuing for security clearance. Overview of Versailles including its massive garden and private hideout. The Baroque style of architecture characteristic of Versailles Palace impresses people by its luxury, with colossal murals and rows of monumental statues. 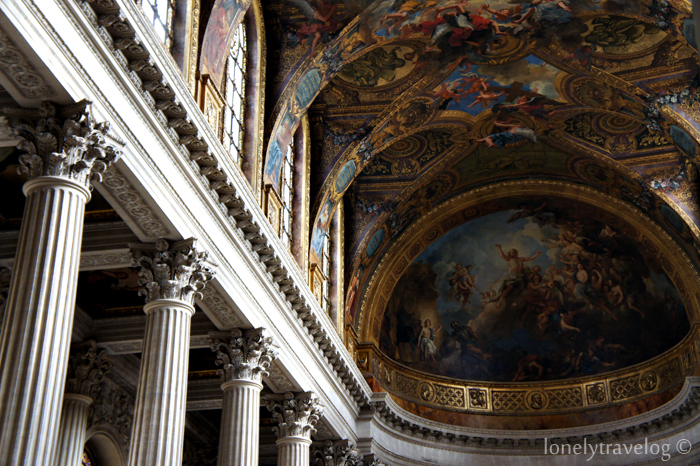 One of my favourite spaces is the Royal Chapel of Versailles, built by Jules Hardouin-Mansart between 1698 and 1710. The lofty structure reminds me of the Gothic style with its large window arcades and its columns supporting the arched vault of the nave. The decoration is a harmony of white and gold contrast. Marble was not used for the interior decoration except for the rich flooring of polychrome stone which illustrates the decorative exuberance invested here. 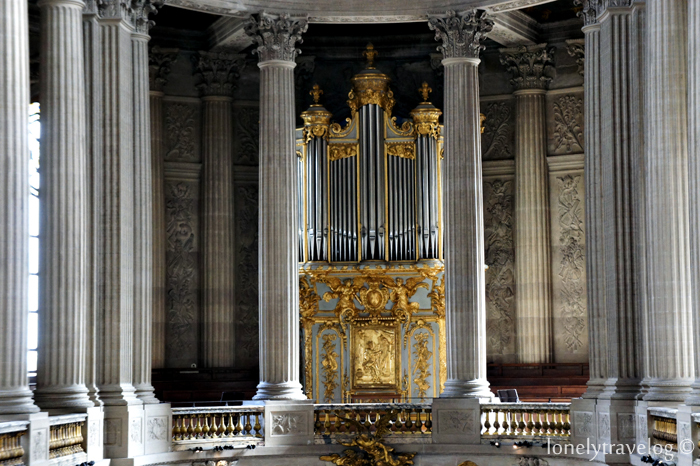 The Altar of the chapel located at the center is the very spot where Louis XVI married Marie Antoinette. Above the Alter, incredibly century old pipe organ which is still functional. Here is the view from the 2nd story balcony where the highest royals and the King would attend services. The King would only go down to the nave for important religious celebrations. 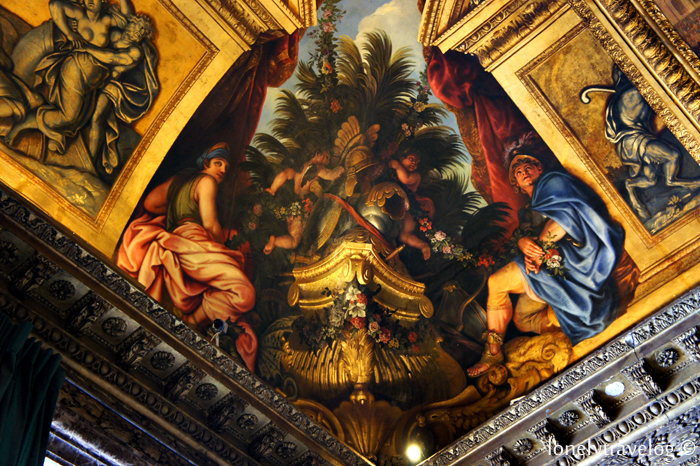 The ceiling mural was recently restored and is truly breath-taking. The paintings and sculptures evoke that idea in a series which starts at the nave and ends at the gallery where the king would sit. In case you are wondering how the organ sound like. Main door ceremonial key of the Royal Chapel of Versailles. Commissioned by Louis XIV, it bears his initials, the interlaced double L, surmounted by the royal crown with fleurs-de-lys. The “tooth” has a fluer-de-lys openwork design. The King’s Grand Apartment consist of 7 prestigious room enfilade that were meant to serve as a parade apartment which is a venue for the sovereign’s official acts. 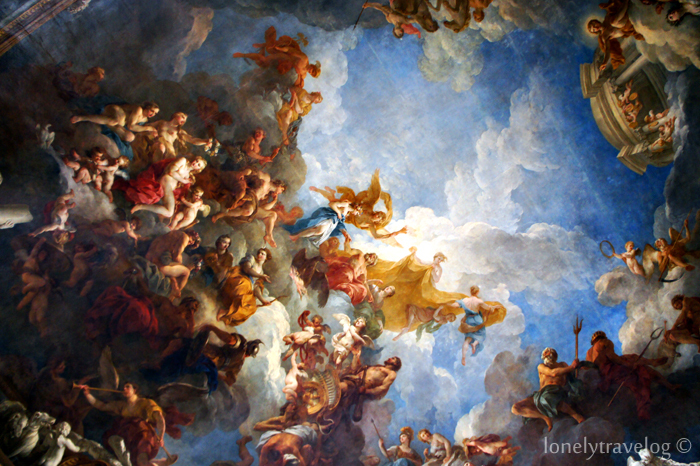 One of it is the Venus Salon, which presents the most baroque decor. 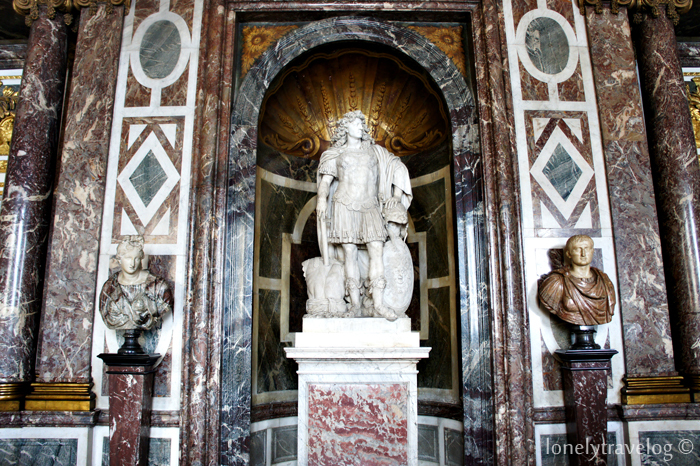 Smack in the center is the statue of Louis XIV dressed as a gladiator by Jean Warin 1671. Venus is depicted on the ceiling with the features of the Goddess of Love who, in Greek Antiquity, was associated with this planet. 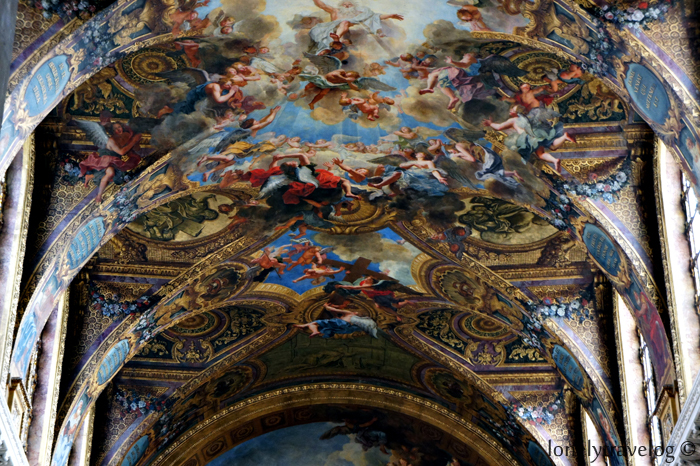 The other painted compositions, which decorate the arches of the vault (mouldings), represented the actions of ancient heroes relating both to the planet of the place and the actions of Louis XIV. The Mercury salon was refurnished in late 2012. The restoration of the paintings and carvings of the ceiling has been accompanied by a refurnishing programme to enable visitors to discover what the ceremonial bedchamber of the king used to look like. The bed which can be seen now is the one which Louis-Philippe had installed in the King’s chamber when Versailles was transformed into a museum. The King’s Chamber (left), opulent decor of gold and silver brocade on a crimson ground forms a backdrop to paintings chosen by him. 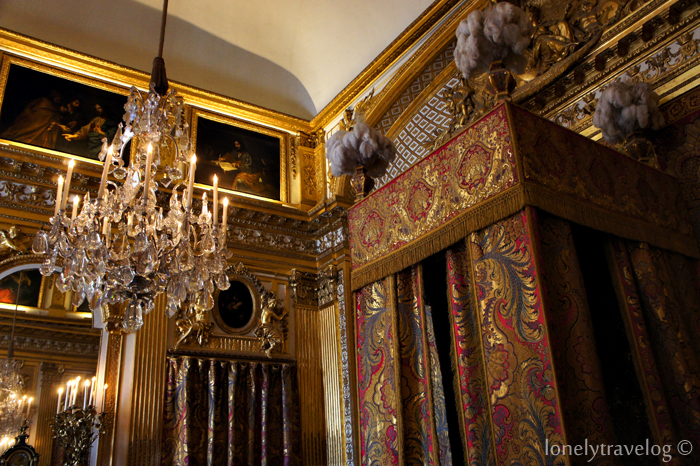 In this chamber that Louis XIV died on 1 September 1715 after reigning for 72 years. Adjacent to the King’s Chamber is the Council Study (right), decorated in sumptuous wood panelling. 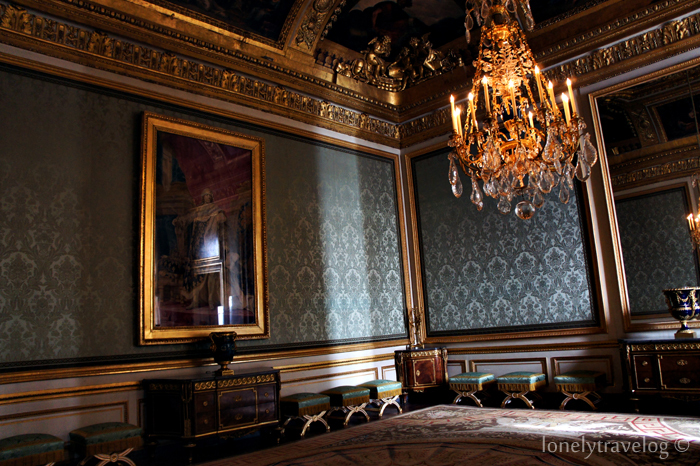 Moving on is the Queen’s Grand Apartment, symmetrical with the King’s Grand Apartment. Heavily decorated Queen’s Chamber bed. 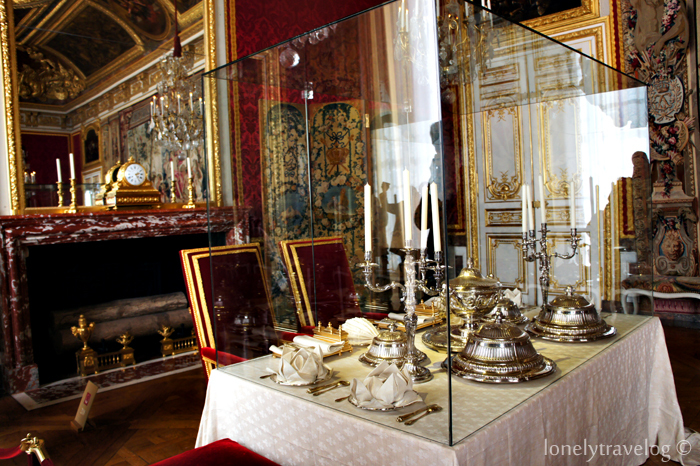 The Nobles Salon and the antechamber of the Grand Couvert where the meals were had. The Hall of Mirrors is the palace’s most glittering jewel. With its 357 mirrors, 17 glass doors, marble walls, chandeliers and ceiling paintings, it remains – as was the Sun King’s intent – a sight breathtaking in its majesty. I’m blown away not just by the sumptuousness of every detail: the gilding, murals and big chandelier. 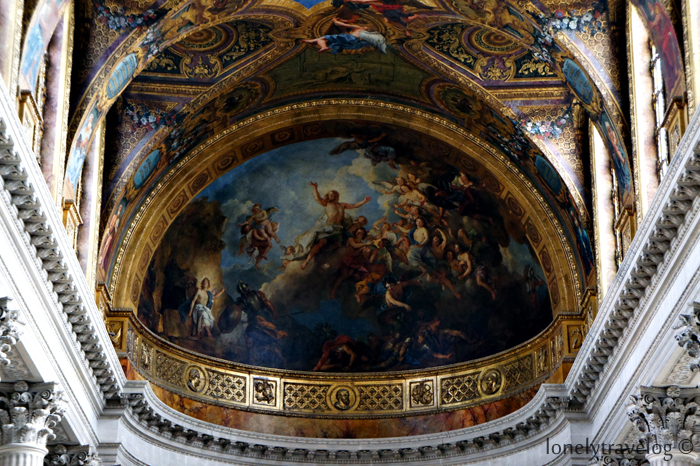 The ceiling decoration is dedicated to the political policies and military victories of Louis XIV. As I look over the window, the views over the gardens are spectacular. The garden covered with snow is laid out in a geometric pattern of paths, bushes and trees. Ground-floor apartments were reserved for the leading members of the royal family. 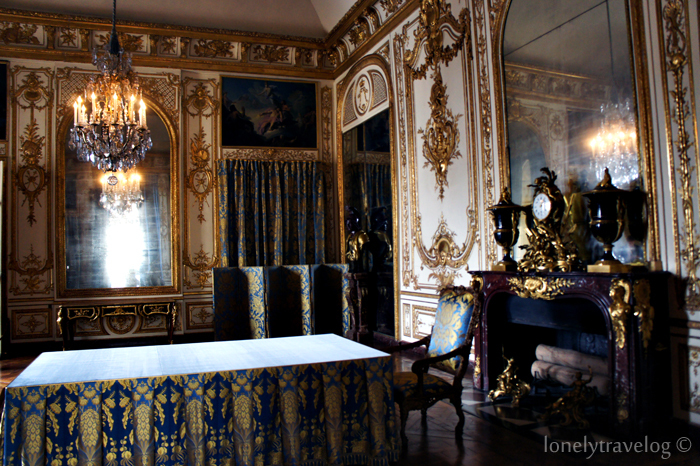 The Dauphine’s Bedchamber is where Marie-Josèphe de Saxe gave birth to no less than three Kings of France in this very room: Louis XVI, Louis XVIII and Charles X. The Dauphin’s Bedchamber. The dauphin’s bed no longer exists and has been replaced by a bed “à la duchesse” – a bed whose canopy is not supported by pillars. Its fabrics are decorated with foliated patterns and medallions in petit-point. As the garden was covered with snow, I didn’t really explore much here. The gardens extend as far as you can see which was completed over a period of 20 years. This is the central frieze of the Palace from the gardens. The Hall of Mirrors extends all the way across this central section. There is not much to be said about Versailles that hasn’t already been said. Overwhelming, stunning, unmatched, awe-inspiring. Versailles is all that and much more. Nice pictures! !1 Reminds me of the time I spent there! 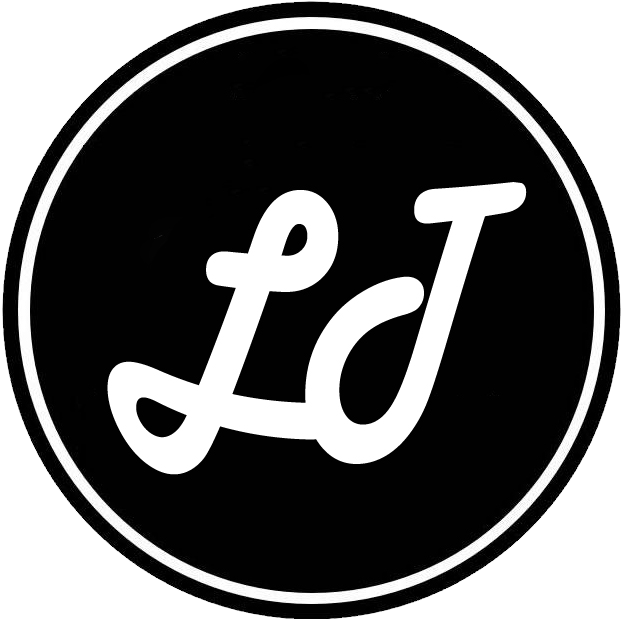 Here’s my post about it too! I’ve seen your post. Great pictures! I’m wondering where the people go. Seem like the castle pretty empty when you were there. I was there very early, maybe that explains why because after I left the place, it was getting very crowded! ahh I see that explains it! Thanks Deepa. I really enjoyed the history of the Palace. Im glad this post brings back the memories. Fascinating. Your photos really show the opulence of the place. Your directions on how to get there are really clear too. Thanks Suzanne. Yes it is such an elegance palace.